← The Ask by Sam Lipsyte – fiction philanthropy? 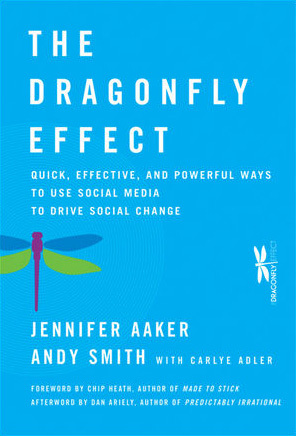 I very much enjoyed this book published late last year and subtitled ‘Quick, effective and powerful ways to use social media to drive change’ by Jennifer Aaker and Andy Smith with Carlye Adler. “The dragonfly is the only insect able to propel itself in any direction – with tremendous speed and force – when its four wings are working in concert.” The premise of the book is that there are four prongs to any networking call to action campaign which should be utilised together to achieve the best results – and that small actions create big movements. The introduction states that reading the book “might help you become a happier person”. This might well be true. I found that I was incredibly inspired by the stories and case studies presented, and brought close to tears by others. It felt a bit strange reading on my suburban train and being moved by a non-fiction text on social media and social activism – but there you have it. One of the key themes introduced by the book is the importance of ’emotional contagion’ in conveying a not for profit message. This was especially poignant in campaigns which have used currently available social media such as twitter and facebook to great effect – ranging from the quest for more South Asian blood marrow donors to be registered in the US – see help sameer – to Alex’s Lemonade Stand – started by a little girl raise funds to research her cancer. The Dragonfly Effect is about how to get people involved in a cause by participating – through volunteering, or donating – time, skills, registering on a blood marrow database, or giving cash. There are useful tips on how to harness the power of blogging such as getting the person you are trying to help to write, being authentic, using the blog as a platform to take a stand and incite action, a facebook bootcamp – which again stresses authenticity, a storytelling bootcamp – keep your audience wondering what happens next, get attention fast, make it sticky, focus on the protagonist, clearly identify what you want your audience to do. (Note that both the facebook and story telling bootcamp have a clear call to action as their final point). There is a very slight tendency in the book to over-itemise steps – there are the four ‘design principles to engage’ and steps such as Focus, Grab Attention, Engage and Take Action. Some quite complex flow charts were also included which I found a little overwhelming. If I were running a not for profit I don’t know that I would religiously follow all of the steps as if this were a how-to guide, but I would certainly think very carefully about the examples used and analyse more closely the effective and compelling calls to motivate volunteers to participate in the particular causes presented in the case studies. While I was reading I found myself taking the time to go on-line to look up the examples given to read about them in more detail (and even follow them myself on twitter or facebook) – particularly things like Charity:Water and the Help Sameer and Alex’s Lemonade Stand mentioned earlier. I also liked the Dragonfly Encyclopedia of Asks – which listed six types of ask – and here we are talking about making a request for support – as opposed to The Ask referred to in the novel – the potential donor. These range from the subtle indirect (implied) ask through to the authoritative ask – very well worth a look. Reading this really made me wonder about volunteerism and social engagement in Australia – and whether it is less prominent than in the US because of our ability to rely on the welfare state safety net. Many of the stories in the book relate to urgent calls for action (ie finding a marrow donor for a particular recipient within an imperative timeframe, to support research for a girl dying of leukaemia – real life or death situations) – whereas my impression of volunteer participation in Australia is that people don’t engage so readily. Are there more barriers to participation here? If fun runs and Daffodil Day morning teas are not one’s thing, and you aren’t on a school PTA committee, how does one get involved more in the local community? I would be interested in your feedback on volunteering and social activism/engagement in Australia, and how you are involved in social action/change. This entry was posted in donate, fundraising, philanthropy, social action, social media, volunteering and tagged social change, social media, social network, twitter. Bookmark the permalink. One of the biggest barriers to volunteerism is the capacity of organisations to support volunteers. Volunteers must themselves have a lot of capacity for self direction and initiative as well as a commitment to the organisation or cause they want to work on in low capacity organisations. I had a great early volunteer experience and a poor one when I was unemployed and walked in off the street to volunteer two organisations near my home. One had a fantastic administrator who had a clear understanding of volunteerism and forged a great volunteer team, empowering us and respecting our contributions. Our volunteer cohort are still friends twenty years later. The other organisation did not know how to help me overcome my barriers in their org. I certainly didn’t understand them until much later. I soon stopped going in. Small organisations often reject volunteers because they don’t have the capacity to help the volunteers integrate with the organisation. It does take time and staff energy to create inductions for volunteers, to manage and supervise their work. A lot of small organisations don’t seem to believe there’s a return on this investment. I sometimes think that a lot of good could be done by teaching delegation in high school, not leaving it to on the job learning. Thanks for this insight Malissa – volunteering is daunting – and some of the organisations that do support volunteers well still often have barriers to involvement in terms of their requirements for attendance at information sessions, training and working with children and police checks. I wonder if there is a way to change the culture of that here for volunteering that sits between no-skilled and highly-skilled. Leadership Victoria and AbaF offer skilled volunteering placement – but that is very much on a one-to-one basis and very much high level transfer of skills or board member placements. Volunteering Australia’s Training & skills resources title=”Volunteering Australia’s Training and skills resources”. Now there’s something that would have been handy a couple of decades ago.